Sewing Pattern Chari Dress is a simple dress with a V-neck in the front and back that is finished with a volant. You can sew it with an elasticated waistline or with a belt, with or without sleeves. This is a 2 in 1 pattern. You can also sew this dress as a shirt. 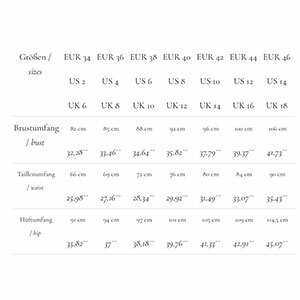 Note: Size chart is in EU sizes. For picture and video tutorials courtesy of Schnittchen Patterns please click here. Suggested fabrics are cotton jersey, cotton lycra, double brushed poly, lightweight cottons or viscose, and other woven.